It can be a little intimidating when taking off but it'l gets easier from there. Instructors are all very experienced and they have zero accident to date. The instructor shouts, "go!" 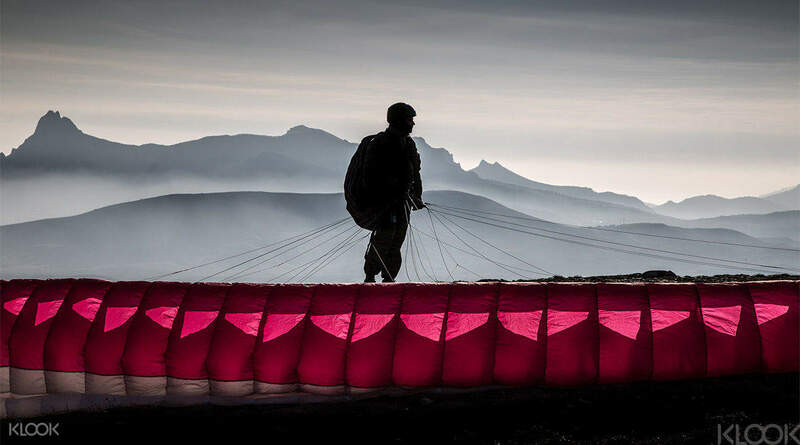 Your adrenaline spikes as you run full speed over the mountain side, as the wind catches the parachute perfectly. 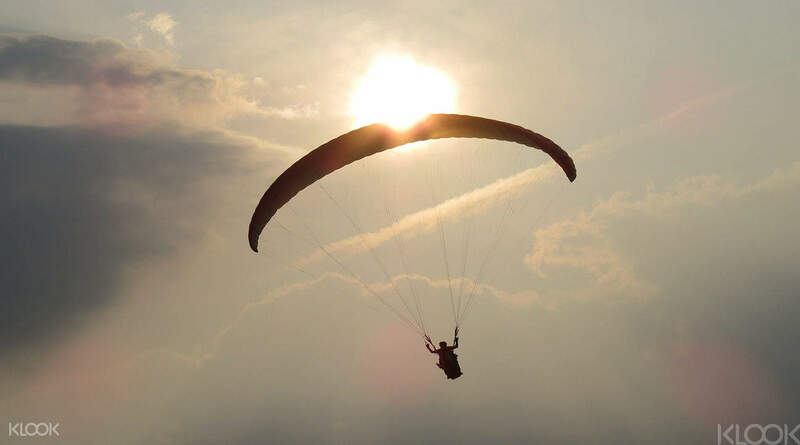 The parachute effortlessly lifts you up on cue and then you're soaring. 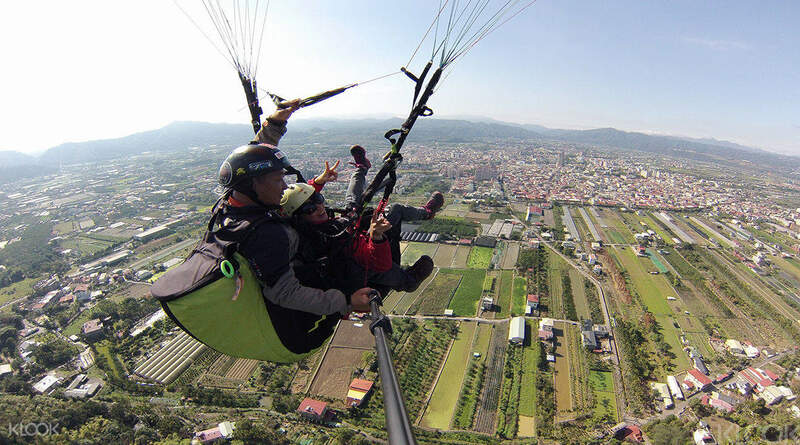 This Nantou paragliding experience provides a surreal view of the city's ancient lake basin and magnificent mountains. Take in the ocean breeze and humid air as you fly for around 8-12 minutes. The surreal thrill and magical birdseye view will leave you feeling like you've just awoken from a pleasant dream. It was the BEST experience! The staff were so friendly and cheery! I went on a day after one day of sunny weather and was told that should the sunny days follow, the draft will be stronger for the next few days and customers can fly higher! So check the weather forecast and let the sky clock in more sunny days before you plan your trip there! On Friday, I went from Taipei via the HSR train (931am) to Taichung and bought a NanTou bus ticket for NT$140 at/from Taichung HSR station to Puli Bus Station (one-way) and reached at 1135am. They arranged a shuttle bus to pick me up at 12pm. Avoid weekends as I was told by the staff that there will be tourgroups. I was a solo traveller. I waited until around 2pm to fly the highest compared to the rest! The wait might be longer depending on the weather but the staff were very hospitable and made sure to explain to us why there was a delay. They even taught us how paragliding works depending on the weather and gave us homemade cheesecakes! My instructor showed me different parts of the land below me during flight and I appreciated that he made me feel very at ease even though he was trying very hard to find a updraft so we could fly higher. My favourite part was the descend! Your instructor would alert you before he does it and wooooo! I made a good choice in choosing the pair of aviators that I borrowed from the staff! The wind will hit your face hard so make sure you have your lips moisturised and a big pair of aviators to prevent your contact lenses from drying out/coming off! Basically, the staff and everyone (even tho who are just accompanying the Instructors) are very helpful and caring. They make sure they will take care of you through and through. Amazing Taiwanese people. Oh! A plus point I got because I was interested in the other activity of paragliding nearby that doesn’t depend on the weather conditions but slightly more expensive and the plan B for when weather is just not cooperative: the driver who was supposed to send me to Puli Bus Station was informed to bring me to the nearby area to see what the lady boss was telling me about. They fly up from the ground using a rope instead of from a height and depending on the wind. I will come back and give it a try next time! It was the BEST experience! The staff were so friendly and cheery! I went on a day after one day of sunny weather and was told that should the sunny days follow, the draft will be stronger for the next few days and customers can fly higher! So check the weather forecast and let the sky clock in more sunny days before you plan your trip there! On Friday, I went from Taipei via the HSR train (931am) to Taichung and bought a NanTou bus ticket for NT$140 at/from Taichung HSR station to Puli Bus Station (one-way) and reached at 1135am. They arranged a shuttle bus to pick me up at 12pm. Avoid weekends as I was told by the staff that there will be tourgroups. I was a solo traveller. I waited until around 2pm to fly the highest compared to the rest! The wait might be longer depending on the weather but the staff were very hospitable and made sure to explain to us why there was a delay. They even taught us how paragliding works depending on the weather and gave us homemade cheesecakes! My instructor showed me different parts of the land below me during flight and I appreciated that he made me feel very at ease even though he was trying very hard to find a updraft so we could fly higher. My favourite part was the descend! Your instructor would alert you before he does it and wooooo! I made a good choice in choosing the pair of aviators that I borrowed from the staff! The wind will hit your face hard so make sure you have your lips moisturised and a big pair of aviators to prevent your contact lenses from drying out/coming off! Basically, the staff and everyone (even tho who are just accompanying the Instructors) are very helpful and caring. They make sure they will take care of you through and through. Amazing Taiwanese people. Oh! A plus point I got because I was interested in the other activity of paragliding nearby that doesn’t depend on the weather conditions but slightly more expensive and the plan B for when weather is just not cooperative: the driver who was supposed to send me to Puli Bus Station was informed to bring me to the nearby area to see what the lady boss was telling me about. They fly up from the ground using a rope instead of from a height and depending on the wind. I will come back and give it a try next time! It can be a little intimidating when taking off but it'l gets easier from there. Instructors are all very experienced and they have zero accident to date. It can be a little intimidating when taking off but it'l gets easier from there. Instructors are all very experienced and they have zero accident to date. The overall experience was nice. The coach was patient and other staff members were helpful. Video shooting was offered through a GoPro held by myself which was good. The overall experience was nice. The coach was patient and other staff members were helpful. Video shooting was offered through a GoPro held by myself which was good. very awesome experience despite the wait for the wind. flew for more than 10minutes, totally worth it and definitely recommended if you are at taichung, only need an hour of bus to get to the meeting point. very awesome experience despite the wait for the wind. flew for more than 10minutes, totally worth it and definitely recommended if you are at taichung, only need an hour of bus to get to the meeting point. Really great experience for all of us. We were late due to delayed flight and the driver was very patient with us. The paragliding instructor was very experienced and took me to a few spins literally. Awesome! Really great experience for all of us. We were late due to delayed flight and the driver was very patient with us. The paragliding instructor was very experienced and took me to a few spins literally. Awesome! This was a great stop for us on our way to Sun Moon Lake. While the activity is a little pricey, the experience more than makes up for it with the views of Puli township and the surrounding mountains. This was a great stop for us on our way to Sun Moon Lake. While the activity is a little pricey, the experience more than makes up for it with the views of Puli township and the surrounding mountains. It was a really awesome experience. Try and leave some time for the day as the instructors are really nice and if you don't hit the height/time, they will do it again for you. I did a total of 3 times and I added the extreme package (add 1200nt, includes additional time and must hit 1000ft) and it was really worth it. 30mins and I was above 1300ft. Photos & videos are inclusive as well! Thank you Xiao Yang and the rest for making my birthday so memorable! It was a really awesome experience. Try and leave some time for the day as the instructors are really nice and if you don't hit the height/time, they will do it again for you. I did a total of 3 times and I added the extreme package (add 1200nt, includes additional time and must hit 1000ft) and it was really worth it. 30mins and I was above 1300ft. Photos & videos are inclusive as well! Thank you Xiao Yang and the rest for making my birthday so memorable! One of the most memorable experiences so far in your life and worth experiencing with the group handling this activity. 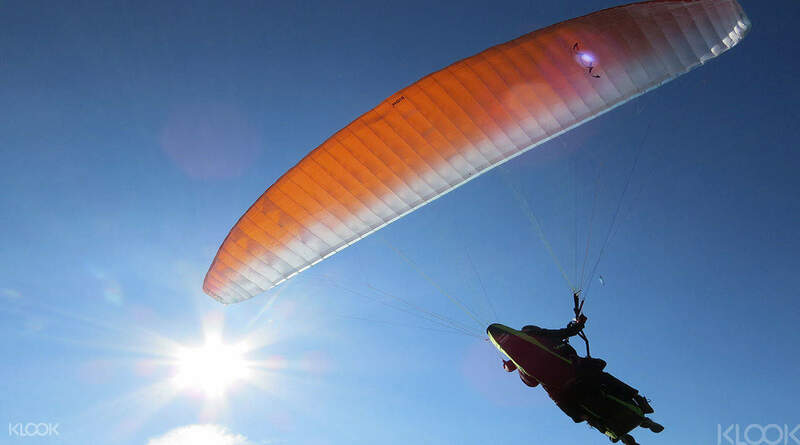 You can see their passion and love for paragliding and their care for first-time fliers to enjoy and be safe during the whole activity. 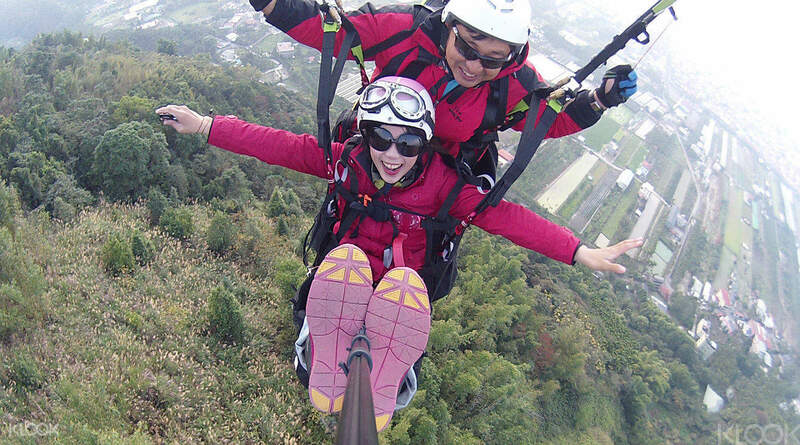 It was only 15-minutes but it felt like infinity, flying over Nantou County. Exhilarating and worth every drop of tear you might have. One of the most memorable experiences so far in your life and worth experiencing with the group handling this activity. You can see their passion and love for paragliding and their care for first-time fliers to enjoy and be safe during the whole activity. It was only 15-minutes but it felt like infinity, flying over Nantou County. Exhilarating and worth every drop of tear you might have. Q: Is there anywhere I can store my luggage? A: Yes, there is somewhere you can put your luggage, however there are no lockers. You can also keep it in the transfer car, the operator will help take care of it. Q: Is the departure place of the shuttle bus near Puli Terminal Station? Q: How long does the whole activity last? A: The whole activity lasts for approximately 1-3 hours. It takes about 10 minutes from the pick up location to the activity location by shuttle bus. The waiting time before your flight and your flight time in the air will depend on the weather and other factors. If your flight is less than 10 minutes, the operator guarantees you a second flight.